The action will take part in far away Egypt, where the high sky seems to be endless and the bright stars are winking at you. Straight in front of you will see a slot machine, win combinations and a jug of gold! This gold will be yours if after you pull the handle of the machine the drum symbols will mach win combinations. A black cat - an object of worship of all Egypt inhabitants will watch closely the process of the play. 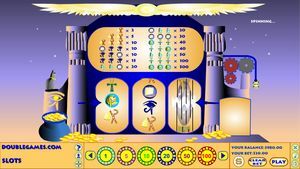 Egyptian Slots is the game for that kind of people who like new and unusual things, it accompanies by national music and it has an original subject and perfect graphics! Live Scores - Watch your favorite game online, you should navigate the software and tune in. You can see games from all over the world.